In terms of specific diversity and behavioral adaptations crabs (~4500 species) are important amongst crustaceans (~26,000 species). The true crabs (Brachyurans) exhibit wide range of habitat adaptations in freshwater, brackish water and marine environments. The burrowing (e.g., Uca spp. ), running (e.g., Ocypode spp.) and swimming (e.g., Callinectes spp.) crabs leave various types of trace fossils, especially in post-Jurassic sedimentary rocks. Proper interpretation of the fossilized crab burrows from rock records in terms of geoenvironmental, hydrodynamic and geomorphological parameters demands a thorough understanding of the biophysical mechanisms involved in the burrowing processes of true crabs in different modern environmental settings. 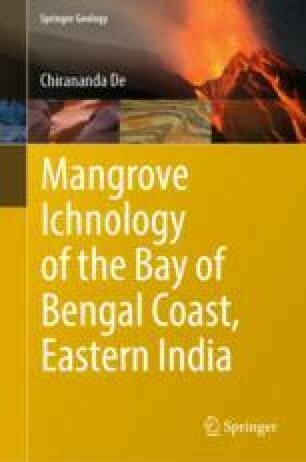 The biophysical mechanisms of crab burrowing both in shallow tidal marine and estuarine river bank settings as interpreted from the present study are addressed in this chapter. The application potential and significance of the present biophysical model of intertidal crab burrowing in ichnotaxonomy, recognition of fossilized crab burrows, characterization of the Psilonichnus ichnofacies, palaeoenvironmental and palaeogeographical analyses have been addressed here.